Pre-planning for a trip is important. While most think of itineraries and packing lists (I do that. Usually. ), the top of my list is usually not reserved for things like "tickets" or "passport". Before leaving on any trip, I've usually researched and noted spots for local coffee. Traveling with Reneè is nice, because it allows for more spontaneity. She can research, while I drive. Saves time (I don't research coffee shops while driving), and we end up at some great places. Because of work, family, and friends, we go through Nashville, TN a lot. We lived there for a long time. The in-laws live close by. The day job requires me to be there a fair amount recently, as well. It was on one of those trips through the Music City, that Reneè found Dose. Dose currently has two locations. One in East Nashville (which I've not visited). The other is conveniently located on Murphy road, off I240. This makes it a perfect pit-stop when passing through Nashville. Dose uses Counter Culture coffee roasters, which is great. Counter Culture is a North Carolina based roaster. They've has done well with their wholesale distribution business model. Many shops I frequent throughout the Southeast use Counter Culture. And I don't complain about the product. Dose is different from the typical Counter Culture-serving shop. They feature a rotating offering of small-batch coffee roasters from around the country. This makes for an interesting visit every time I am in town. I've only had but a sip of espresso drinks from Dose, as my go-to is a single origin pour-over. But, they please my latte-loving wife and she goes back for more. I've also been completely satisfied with my brew. Every time. There's always something different on tap, so it's fun to try coffee from various regions of the world. During my last visit, they served up something from Rwanda. It was a perfect flavor blend of sweet citrus and floral. The game-changing quinoa salad happened on my last visit. I stopped by on my way out of town, thinking I was going to get a simple coffee for the road. When I arrived, I realized two things. So I did get the quinoa salad, with a lemon-raspberry scone, and a coffee. Turned out to be a perfect late lunch, before hitting the road. And the wifi was strong in this one. Work was accomplished, it was. My only negative with Dose is the parking lot at the West End location. It is a little tight, and somewhat limited. And the liquor store next door frowns on you parking in front of their place. 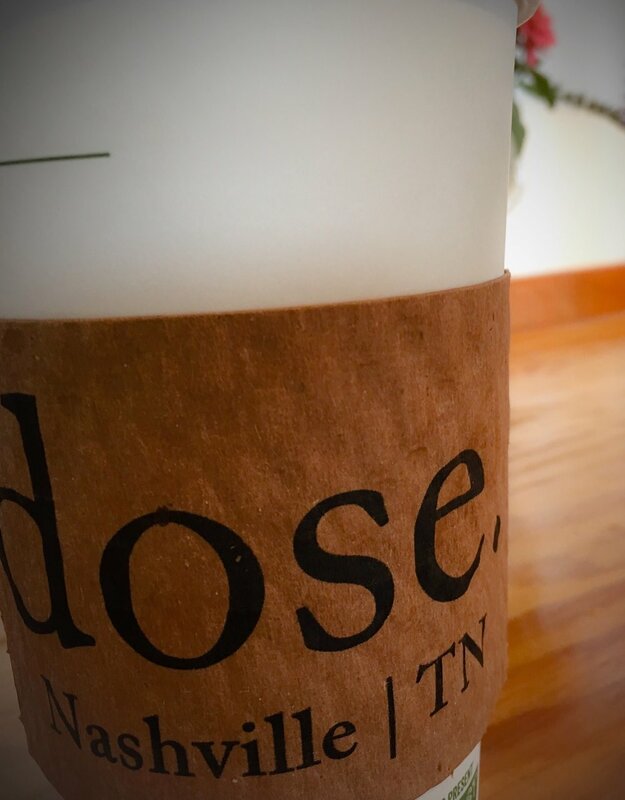 When you're passing through Nashville, pit-stop at Dose.